Creative? Of course you are. Artistic? Maybe...or maybe you just haven't yet built the skills and confidence to apply a brush, play a tune or pop a move. The important thing is that we use our brains, bodies and spirits to learn and evolve. 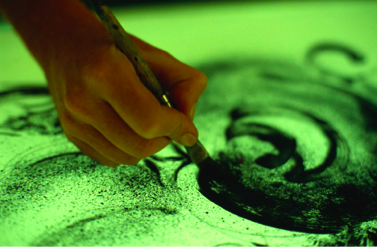 Why is creativity so important to leadership? The recent IBM study of CEOs in a time of increasing complexity identified creativity as the #1 desired leadership skill. Consciously evolving organizations and their leaders recognize that, along with lean and agile processes, companies benefit when teams and individuals are skilled in thinking and innovation techniques. At the 60th anniversary conference of the Creative Problem Solving Institute, over 500 educators and innovation practitioners came together to learn and share facilitation, coaching and leadership practices. Participants from companies like Proctor & Gamble and Seimens along with international governments, NGOs and consultants met in University of Buffalo classrooms. We came to learn from creativity and innovation experts, as well as from each other. 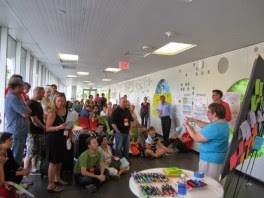 I had a blast presenting a daylong Visual Facilitation Skills workshop with Leanna Murphy and Mike Werner. Twenty five participants learned how to capture ideas and present them visually to facilitate productive collaboration. Some students even applied their new skills in graphically recording evening lectures and panel discussions. Leanna Murphy Dono is an energetic, skilled and supportive teacher. She makes graphic recording looks easy by breaking down the process into simple strokes. She had lots of tips for ease and effectiveness...right down to the kinds of pens and tape that work best. Mike Werner brought his honed illustration skills that showed how powerful imagery is. His work added color, definition and clarity to the conference activities. 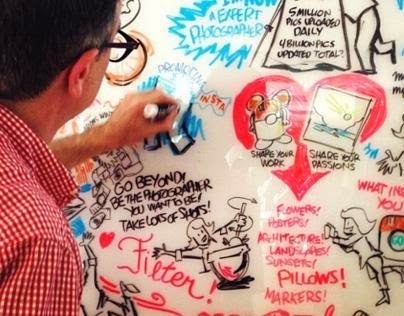 My role was to give examples of how I use graphic facilitation in my work in organizations, helping teams see the big picture and co-creating a vision of the future. • Vision. A smashing leader must bring vision to life 4 that they must be future focused i.e. they must know, what is to be done, How it is to be done & For whom it is to be done. This can be done by casting their vision and ensuring that they have the right people in right place. • Emotional Intelligence. Good leader is always wiser with people with whom they work with for this they must be well versed with Emotional Intelligence skills. True leader should know how to use power of other people emotions along with their own this will help them more productivity and collaboration which will help them to grow further. • Effective Communication Skills. Savvy leaders are the one who is a mint listener, ask question and speaks if something is to be said. In leadership communication is a key, leader must be able to communicate with others but being a mint listener will surely going to help. • Inspiring Gratitude, Personal Responsibility, and Sacrifice in your Corporation are essentials leadership at work. Definitely, I agreed with the fact that creativity is important for leadership. Therefore, we should refine our creative skills to develop our leadership attitude. Creative and leadership both are manually developing in our attitude and personality, therefore in most of the occasion, we should also following different types of coaching programs to develop our leadership and creative skills. Thanks for such wonderful instructions.